Now in stock at The Mower Shop Northampton LTD we have the all new electrical lift deck for Stiga ride on mowers we currently have the QF 110cm and 125cm decks in stock. If interested please visit us at our showroom in West Haddon and one of our friendly and helpful staff will be more than willing to help. The NEW 110cm Combi Pro Electrical Quick Flip cutting deck for Park and Park Pro models. The 110cm cutting deck has 3 freely rotating blades for the best cutting results and a cutting height range of 25-90mm. Pivoting wheels allow the machine and cutting deck to turn easily avoiding damage to the lawn. In case you need to cut higher or rougher grass you can easily shift from mulching to rear discharge without using any tools. The Multiclip mulching function cuts grass clippings into extra fine particles and recycles them into the lawn as a natural fertilizer, plus there is no need to stop and dispose of grass clippings, saving you time and money. 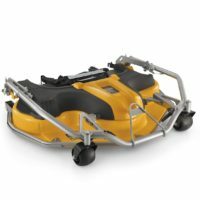 When you are done mowing, the new unique Quick Flip system allows you to access the cutting deck in just one move to make cleaning the deck quick and easy. It is lawn mowing the way it should be – made easy. This Quick Flip cutting deck in Pro version for Park and Park Pro has a cutting width of 110cm. Suitable for those wanting to cut long grass quickly with rear discharge. Switch between Multiclip and rear discharge without having to use tools. Pivot wheels make it easier to turn. Variable electric cutting height adjustment from 25 to 90mm.